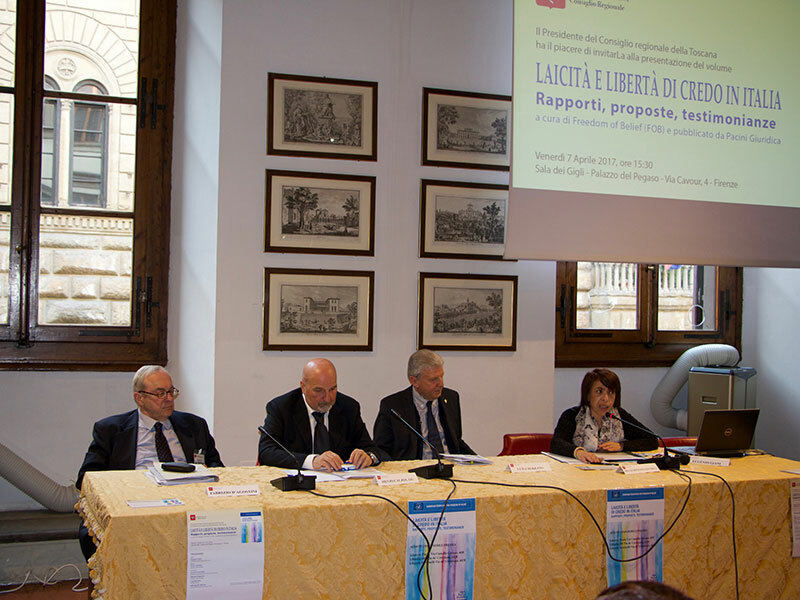 FLORENCE – Friday, April 7, 2017, at 3.30 PM in the "Sala dei Gigli" of the "Palace of Pegaso" of the Tuscany Regional Council there has been the presentation of the volume of the acts of the Conference held on 21 December 2015 by FOB in Rome, in the Globe Hall of the Chamber of Deputies. 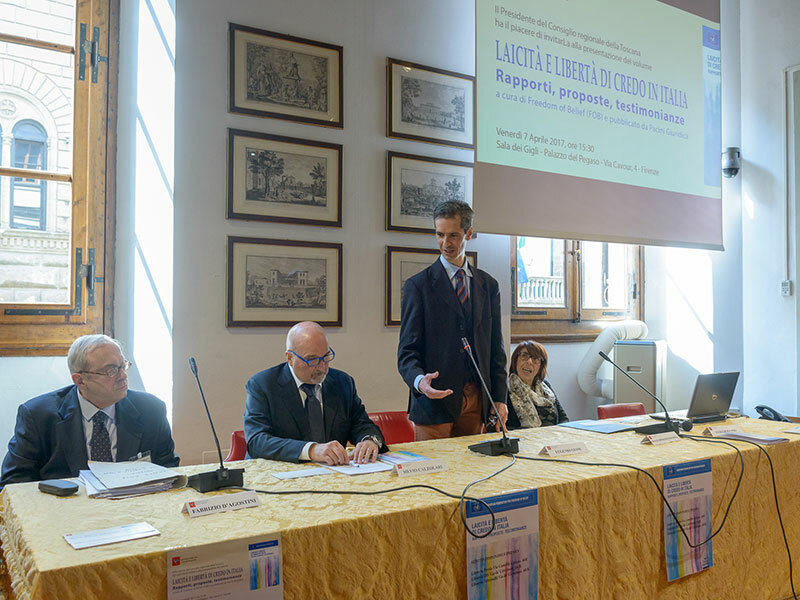 The conference in the Tuscany Regional Palace was introduced and moderated by the Secretary of FOB, professor Silvio Calzolari of the Religious Sciences Higher Education Institute of Florence who – after reading the message with the wishes sent by Hon. 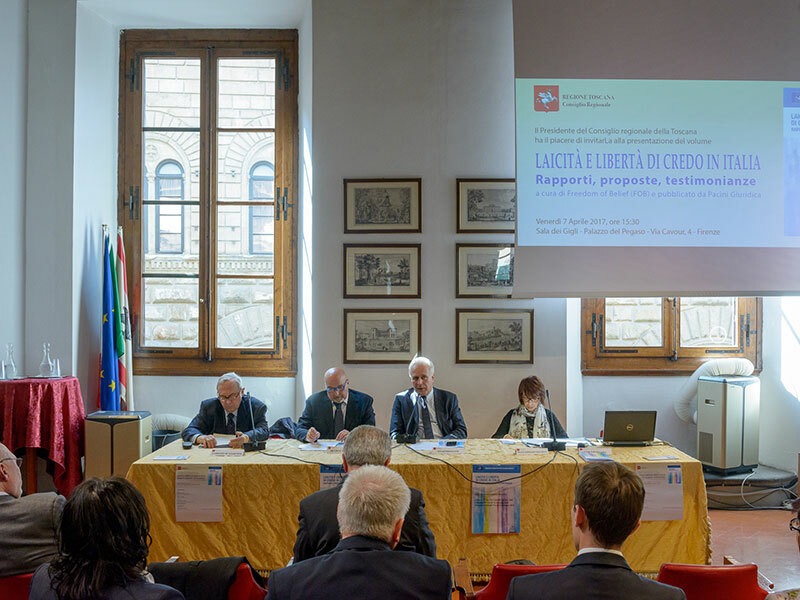 Luciano Ciocchetti, unfortunately absent due to family reasons – introduced the speakers, stressing how the presentation of the volume of the acts should be regarded as another moment of reflection on the theme of the rights of freedom of religion and belief which are often more or less latently violated all over the world. Then took the floor Dr. Eugenio Giani, President of the Regional Council of Tuscany who, after the welcome greetings, introduced the theme of the protection of human rights, including that of religion and belief, which are among the primary objectives of the Tuscany Parliament. The establishment of the "Festa della Toscana" (Tuscany Festival), which since 2000 celebrates every year the defence and promotion of the fundamental principles of freedom, is the proof of this. It was in the Grand Duchy of Tuscany, on 30 November 1786 that, for the first time in the world, the death penalty was abolished. 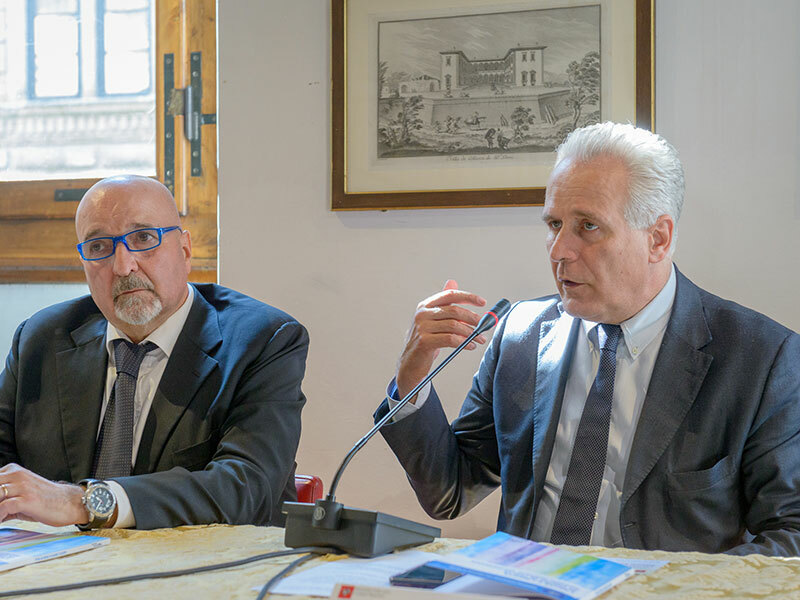 President Giani also emphasized the particular role that Florence has been playing over the centuries as "a messenger of hope and peace": from the Council of Florence in 1439, to the utopia of Marsilio Ficino, to the great dream of the Mayor “saint” Giorgio La Pira. After the intervention of President Giani, there was a pleasant and significant testimony. The Secretary of FOB, in fact, invited to speak Dr. Riccardo Migliori Past President of the OSCE Parliamentary Assembly. Hon. Migliori in his speech inspired by his international experience, highlighted how human rights are, in many nations, often flouted and constantly subject to the continuous socio-historical changes. Hon. Riccardo Migliori stressed that OSCE is an indispensable instrument of dialogue and political negotiations whose primary objective is to contribute to the resolution of conflicts and to the maintenance of peace and stability on our continent. The evolution of new challenges and the current time of crisis that leads to reintroduce borders and raise walls, today more than ever requires a radical change of life patterns, for the sake of dialogue and development. 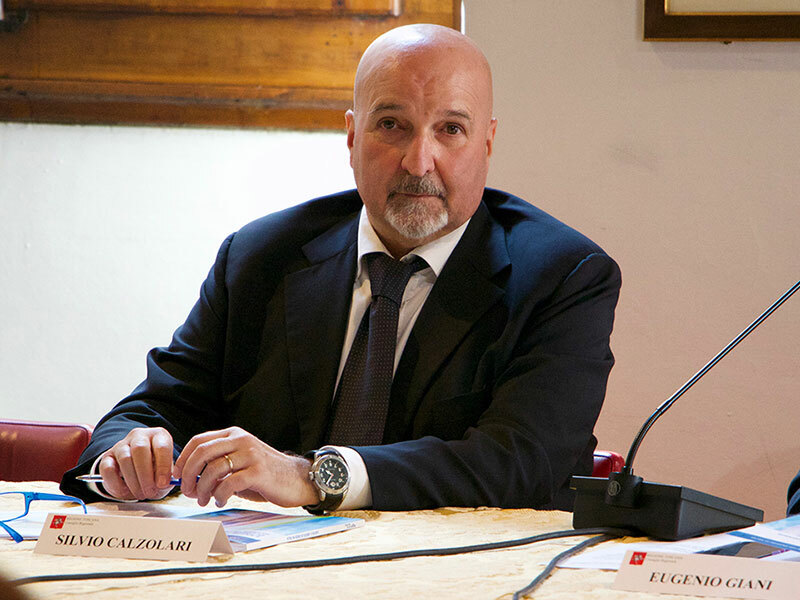 After this contribution, professor Silvio Calzolari took the word and, in his report, he faced some fairly complex issues and deepened the meaning of the words: "secularism" and "freedom", with multiple and sometimes contradictory interpretations. He then illustrated the history of FOB and the reasons for its birth: FOB was created to defend the freedom of belief and religion, because everyone is free to believe or not to believe. Freedom of belief and religion is one of the most important human rights, because it includes the freedom of expression, freedom of speech and association. In our Western world, this seems a right given for granted, but it is not at all. In Italy, as in other European countries, is often a theoretical law that exists on paper; it is sanctioned by laws, constitutional rights and charts, but sometimes is misapplied in practice, and even openly violated. 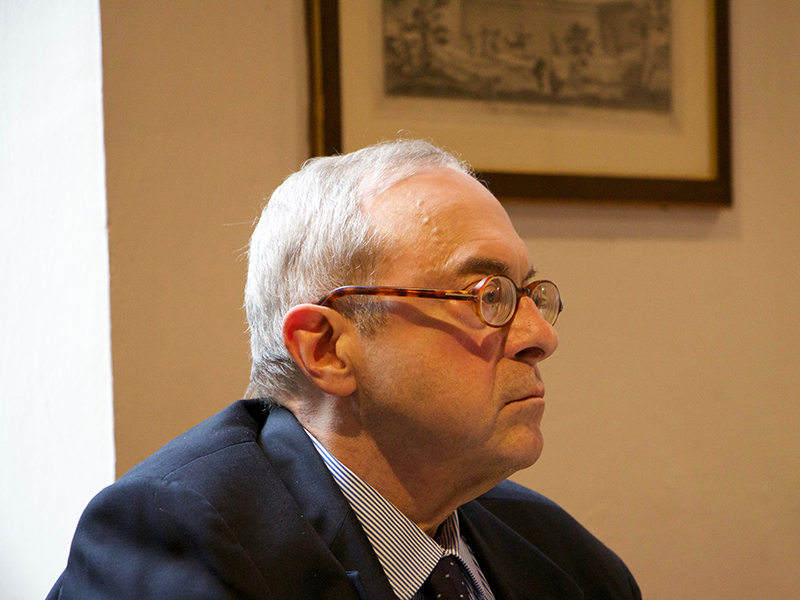 At the end of the report, attorney Fabrizio d'Agostini, philosopher of law and a councillor of FOB took the word. Attorney d'Agostini, in his report, addressed issues of epistemology of religious freedom and history of law: in particular, he analyzed the famous speech of the United States President Roosevelt ("Four Freedom Speech", the "Four pillars of freedom", January 1, 1941) which formed the basis of the "Atlantic Charter" (1941) and the "UN Declaration of Human Rights” (1948). 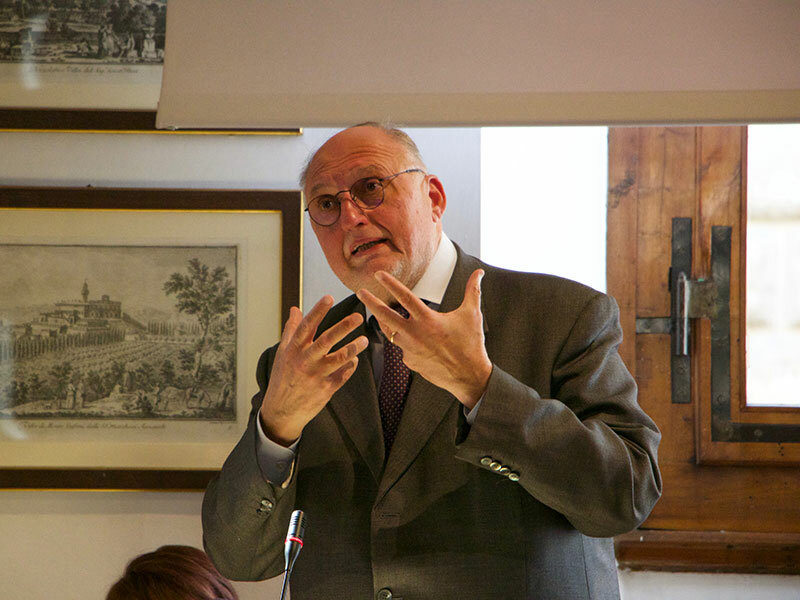 d'Agostini talked about the relationship between ethics and politics and, taking a cue from the reflections of philosopher Norberto Bobbio, also about tolerance as a possibility of coexistence among different confessions and religions. 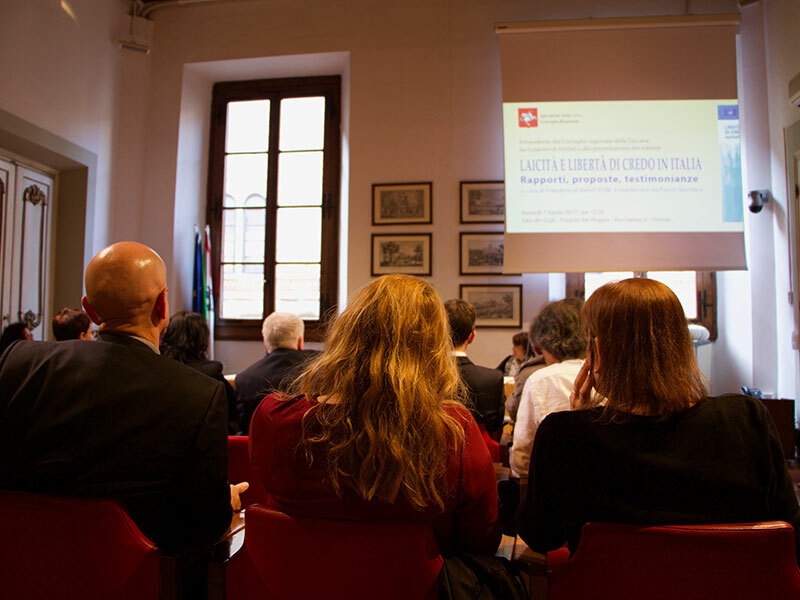 It was then the turn of professor Luigi Berzano, a Roman Catholic priest and sociologist of Cultural and Communication Processes at the Faculty of Political Sciences of the University of Turin. Don Berzano, in his report, spoke about pluralism and religious freedom in today’s individual and group religious expressions. He addressed the issue of religious freedom in a secular State and also that of the new forms of quest for the sacred. 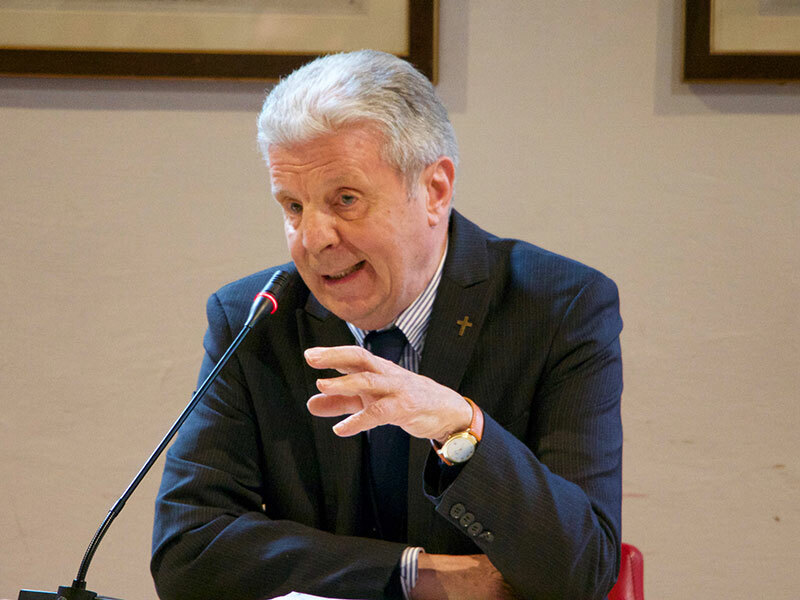 Talking about the spirituality of the third millennium, professor Berzano, analyzed some aspects of Anatheism (term coined by the Irish philosopher Richard Kearney) as a mean of finding new ways to return to the sacred, after the disappearance of the old concepts of God and the decline of religions. This theme was addressed by professor Berzano at a recent Conference held in Torino (1-2 December 2016). The last report of the evening was that of Dr. Nelly Ippolito Macrina, co-author of the "Encyclopedia of religions in Italy." Doctor Nelly Ippolito pointed out the difference between the term "religious liberty" and "freedom of religion"; then she analyzed the development of religious freedom in Italy (from the “Statuto Albertino” to the Unification of Italy, from the Lateran Pacts to the birth of the Constitution and to the law of the so-called “allowed cults" and the "treaties"). She ended her interesting report making a brief reference to the current census of religious realities in Italy: from the old census of 2001 over 200 new groups and religious movements were added. As Secretary of FOB I feel obliged to thank all those who have allowed the realization of the event: the Regional Council of Tuscany, the publishing house Pacini which published the volume of FOB Acts and, of course, the sponsor, the Futura Foundation, for the funding granted to the printing of the volume and the realization of this Convention. Finally, I wish to express the gratitude of FOB to the President of the Regional Council, Eugenio Giani, to the President Emeritus of OSCE Riccardo Migliori and to all those who contributed with their valuable essays. The reports of the various speakers as well as the video of the event will soon be available on this site. Below are some photos of the presentation. Please, click on the images to enlarge them.